Gihosoft Mobile Phone Transfer is a simple but feature-rich application that lets you transfer various types of content such as contacts, call logs, SMS messages, photos, videos and music between Android, iOS and iTunes. Furthermore, the program enables you to back up your phone’s contents to your computer but also restore data from iTunes and local backups. Support is provided for numerous types of Android and iOS devices. Data can be transferred between all combinations of supported devices such as Android to Android, iPhone to iPhone, iPhone to Android, iTunes to Android, iTunes to iPhone and Android to iPhone. 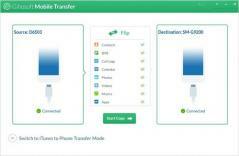 Gihosoft Mobile Phone Transfer is available for both Windows and Mac platforms. It provides reliable data transfer with no risk of loss or leaks.